We have two hands on workshop classes scheduled with an hour break in between. 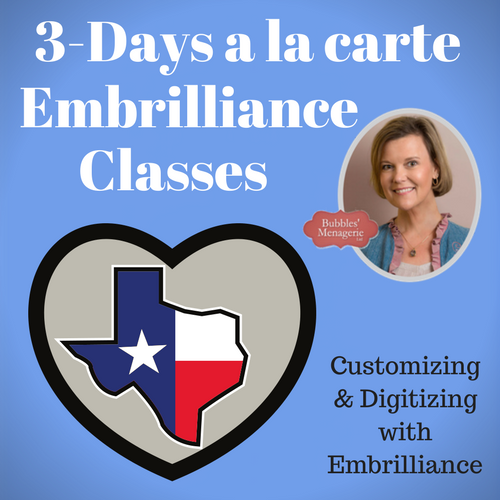 These classes are at the same location as the Applique Getaway event, but they are NOT included in either the VIP or regular tradeshow admission. If you would like to purchase admission to the Applique Getaway – includes more classes as well as vendor floor admission options – I would appreciate it if you used my affiliate link. It does not cost you any extra but I do make a small commission. Click here to register for the event. Each class is a separate registration and is limited to 30 people. These are both SOFTWARE classes where you bring your own laptop. You do NOT have to have a laptop to take the class. The class moves at a slower pace because it is hands on. You are more than welcome to share a laptop or look on with someone else. Do NOT bring your embroidery machine to class. We will go through the basics of the programs from opening designs, resizing, adding lettering, and other customizing functions. From changing colors to adding new colors and working with parts of designs – the learning won’t stop there! We will get into the sewing simulator and learn how to check out designs before they stitch – yes you can resize but how do you know when its a good idea – or better yet, when you REALLY REALLY should do a test sew to verify its a good idea. Bring your questions and come ready to learn. There is so much to the programs, and we will cover lots of tips &tricks to help you customize your designs quickly and easily. We are going to work in StitchArtist L2 which allows us to bring in an SVG file with already drawn objects for us to reshape for digitizing. If you do not have StitchArtist L2, you will want to install the demo version so that you can play along with us for the second part of the class. Since Level 2 builds upon Level 1, we will be discussing LOTS of the digitizing practices that also apply to those using level 1 – the drawing of the objects is what is eliminated in this class because we are using an SVG file.